The Common Core State Standards for math are pushing elementary educators to re-think how to teach math. How do you go beyond skills like adding and subtracting or the times tables to help kids develop a deep understanding of math concepts? Engineering activities are an ideal framework for meeting this challenge. 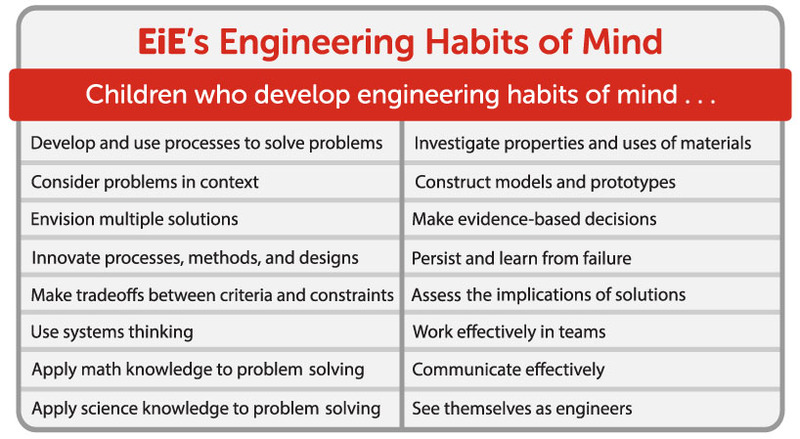 Over the past year or so, the EiE Blog has been exploring “engineering habits of mind”—ways of thinking that kids develop as they engage in hands-on engineering activities. One habit that engineering promotes extremely well is the ability (and inclination!) to apply math knowledge to problem solving. Kids love to tinker and build stuff, and classroom engineering puts these natural inclinations right to work. For an example, play the EiE Video Snippet "Is It Mission Ready?" below. This video gives you a peek inside a classroom where kids are designing, building, and testing parachutes. It’s easy to see how this hands-on engineering challenge naturally calls on kids’ math skills, exercises their problem-solving skills, and provides an authentic real-world context. Watch this short video snippet: "Is It Mission Ready?". The teacher and students in this video are talking about two measurements they’ve made: the diameter of a parachute canopy and the length of its suspension lines. That’s in line with the Common Core standards in the domain “Measurement and Data.” For example, Grade 2 standards call for students to learn to measure using appropriate tools such as a ruler or yardstick. A conventional lesson plan to meet this standard might call for kids to roam the classroom, measuring different objects. But making measurements for measurement’s sake is an abstract process. Kids may not see why you’d ever want (or need) to measure your shoe, the whiteboard, or your desk. On the other hand, making careful measurements is what real engineers do all the time! The kids in the video self-identify as aerospace engineers as they work on the unit A Long Way Down: Designing Parachutes. They’ve designed, built, and tested their parachutes with a clear goal in mind: to make a parachute that drops a payload as slowly and gently as possible. Kids measure the diameter of the canopy and the length of its suspension lines several times as they improve their designs. 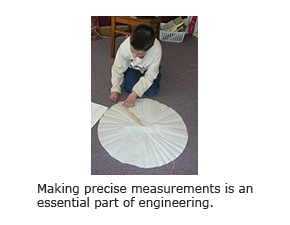 Besides reinforcing measuring skills (see the EiE Video Snippet “Kids Should Measure a Lot” for more details), the parachute lesson gives kids lots of other opportunities to apply math knowledge—and meet Common Core standards along the way. For example, to figure out whether their parachute is small enough to fit on board a spacecraft, kids calculate a “packing score.” They use stopwatches to measure how long it takes their parachutes to fall. And they calculate “average drop speed” in feet per second—calling on their knowledge of decimal notation to report their results. All of this happens before the scene you see in the Video Snippet “Average Drop Speed,” where the teacher is working with her students to review the data sets they’ve compiled. As the students look for trends and provide explanations, they’re meeting the standard CCSS.MATH.CONTENT.4.OA.C.5 within the Common Core domain “Operations and Algebraic Thinking”—and theydoing it in a way that makes math make sense. Share your question about classroom engineering. We'll answer as many as we can! The Teaching Channel offers a short video that navigates you through Common Core math standards. This blog post was first published on 3/31/2015. It has been updated and reviewed for accuracy.